Have you noticed the error 0x80070652 on your Windows 10 computer? You will see this error code with the message ERROR_INSTALL_ALREADY_RUNNING. This error usually takes place when a previous installation of Windows 10 has not been completed successfully. During the Windows 10 installation process, it could get stuck. In such a situation, you will see the error message 0x80070652. When you get this error message, don’t worry about anything because it is possible to fix it. Here are the steps you will have to follow in order to fix the error message. As the first step of fixing 0x80070652 on your Windows 10 computer, you should go ahead and restart your computer. Usually, many issues like this get fixed when you restart the computer. However, the error 0x80070652 will not go away during your very first restart. In such a situation, you will have to restart multiple times. This will resolve the issue most of the times. If restarting didn’t help you to fix the problem, you need to go ahead and run the Windows Update troubleshooter. You just need to run it and it will look for the problems that exist on the computer. As a result, you will be able to fix 0x80070652. As mentioned earlier, you get the 0x80070652 error on Windows 10 due to an incomplete update installation. Therefore, you should think about re-downloading the update, which got failed. You will be able to download the update manually and update your computer. But before you download the update manually, you need to understand what specific update failed. To get to know about that update, you can follow the steps mentioned below. Go to Settings in Windows 10 computer. Then visit Update and Security. Now click on View Update History. Then you will be able to see what specific update has been failed. You will be able to locate it on the status column. Now you can go to the Microsoft Download Center again and look for the specific update, which got failed through the KB number. Once you locate the update, download it and install manually. 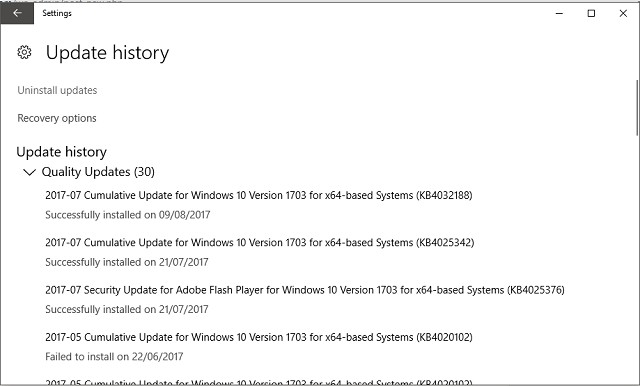 It is possible for you to use the Microsoft Update Catalog in order to figure out the specific update and download it again. Once you install the failed update, you will be able to eliminate the problem from the root cause. As a result, you can overcome getting the 0x80070652 problem. If any of the above-mentioned solutions didn’t work, you can locate another error code, which is displayed in the message you see. If you can see it, you need to figure out that you are getting the problem due to another issue. Therefore, you should go ahead and double-click on the update to find out more information. You can search the Internet for the new error code and see how to fix it.